In our fifth edition of the Donut Dollie Detail, Susan Heinzelman Ladnier tells about serving in Korea and Vietnam, being in a helicopter crash, and making a trip back to Vietnam for the first time since 1968. What prompted you to join the SRAO (Supplemental Recreation Activities Overseas) and want to go to Korea and Vietnam? When I got out of college I wanted to travel but had no money. By joining the Red Cross I could travel and get paid for it. I also wanted to do my part for my country and the war. I started out in Korea. 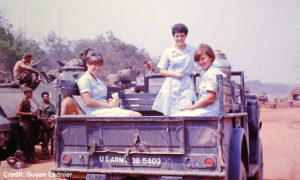 Was transferred to Viet Nam. On the way there, I stopped in Japan and Taiwan, Hong Kong and Thailand. Took R&R in Australia. Stopped in Hawaii on the way home. Da Nang, Qui Nhon. Did TDY to Lai Khe and Pleiku. 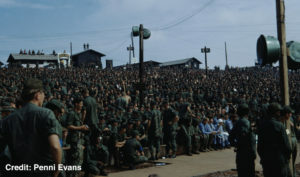 Arrived at Camp Humphries in Korea in 1967. 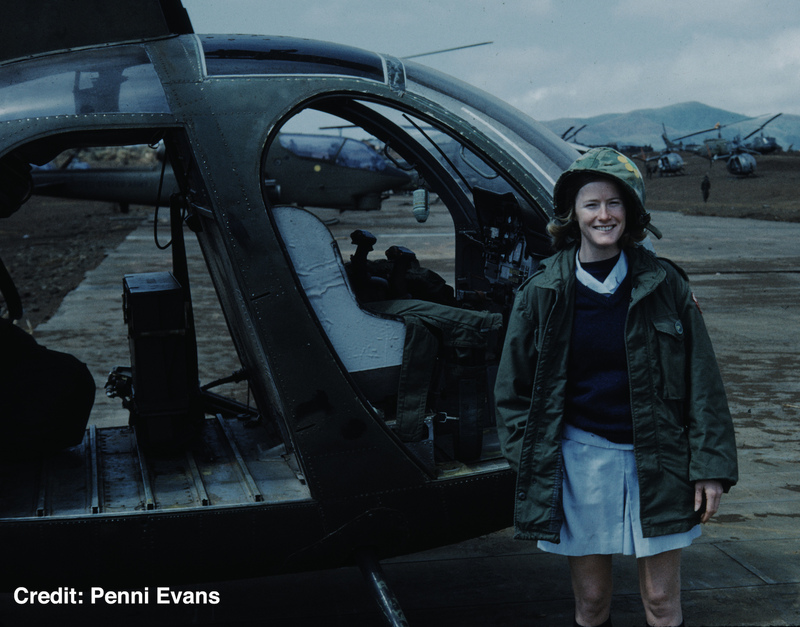 Left in the middle of the Pueblo crisis and arrived in Viet Nam in the tet offensive of 1968. Had to stay in Saigon for awhile, as I could not get out due to tet. I was known as Susie. Get up, transported together to the rec center. From there dispensed out in groups of two to different sites. We did games like jeopardy, etc. We traveled by jeep, helicopter. If we were in the field and fighting started, a helicopter would come get us. The guys just wanted to look at a “round eye” and talk. Some of the stories they would tell were heart breaking. From their girl or wife breaking up with them, to being home sick or traumatized by what they had seen. 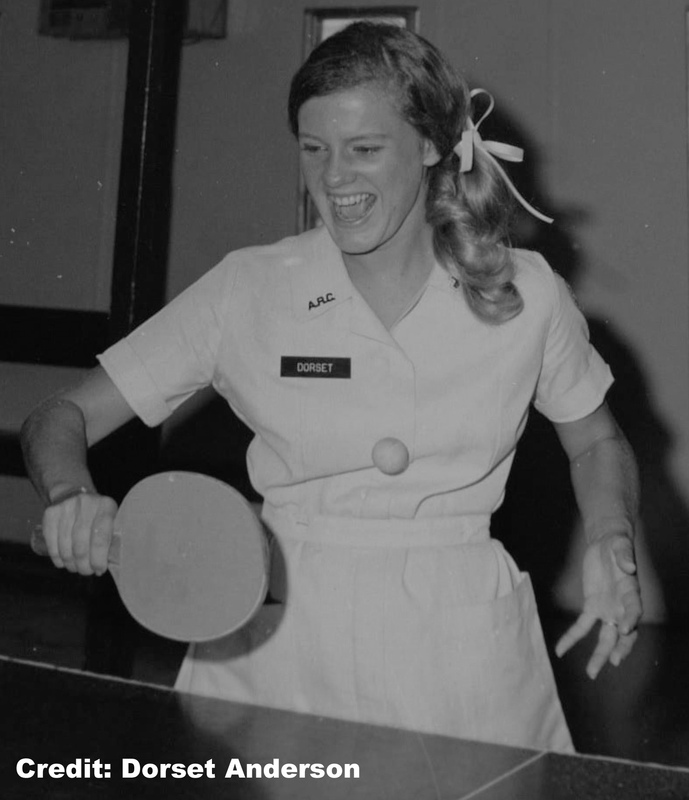 In the rec centers, there were pool tables, ping pong, cards, snacks. Sometimes we would have bands and wrestling tournaments. The fellows had to check their weapons when they came to the rec center at Freedom Hill. If there were any loud noises, everyone was diving for cover. In DaNang, we lived in a French Villa with guards. In Qui Nhon, we lived in a trailer. Looking back, I was so naive, I was not scared or worried. A couple times, I was able to get a radio patch back home to my parents. Out in the field, we ate the same rations as the soldiers. If we had to use the bathroom, they would hold up something to make a curtain. Needless to say, we tried not to drink a lot of liquids. Had to get in bunker several times. Had to be evacuated from the field numerous times. Flew fast and low in helicopter so we would not get shot down on the way to outposts. Could hear fighting and loud ordinances going off. Was in a helicopter crash when I was in Korea. We were on our way to Seoul when on takeoff a rock got thrown up into the blade. Came crashing down into a rice paddy. Fortunately no one hurt but there were many scared Red Cross Donut Dollies. 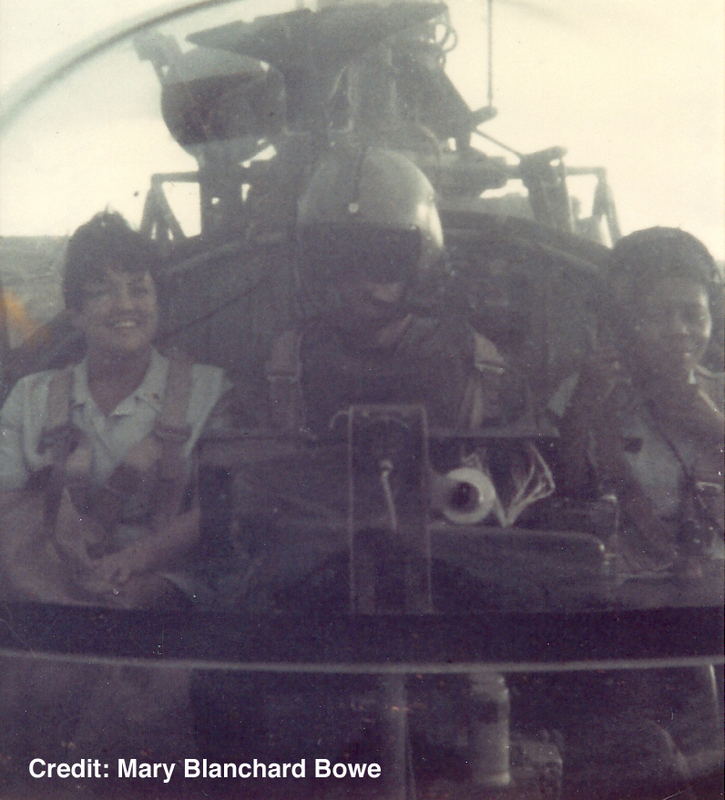 After that, the fellows, knowing what had happened, would auto rotate the blades to make it feel like we were falling out of the sky, just to scare us. They did. 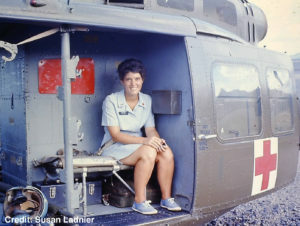 To this day, I do not like flying and would not go up in a helicopter unless it was an emergency. Very emotional. Helped them write letters home and just let them talk if they wanted. Was stationed at Walter Reed when I got back. There were two very handsome guys who had lost multiple limbs in beds next to each other. Their wives had visited and had never come back. Felt so sorry for them. The two fellows kind of fed off each other and tried to make the best of it, but you knew they were devastated. In the states, I did hospital recreation at Walter Reed and Newport Naval hospitals. We did games, crafts and moral support. In Vietnam, we would visit the field hospitals where the guys came before being evacuated. Some of the fellows that were not too badly hurt, did not want to leave their buddies. 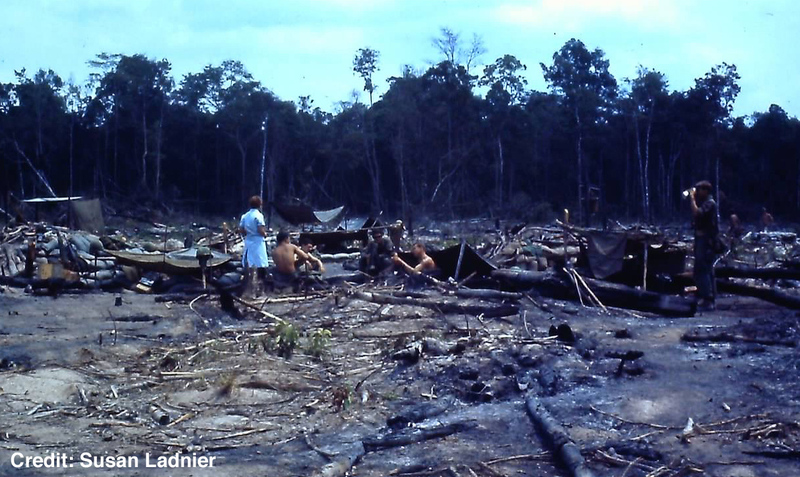 There is not a day that I do not have flashback to my Vietnam days. Very hard and emotional. Could not understand why people were concerned about the trivial things in life like a scratch on your car. To this day, I tear up talking about Vietnam, hearing the Star Spangled banner and seeing GIs. I want to go up and thank them but I would start bawling. Loud noises bother me. One time at the beach, (my kids who know loud noises bother me and love to do loud noises) my son set off one of those packs of 144 firecrackers. My natural instinct kicked in and I dove behind a log. Of course, they thought it was hysterical. I had to laugh, too, after the fact. Fireworks and cannons going off make me jump. 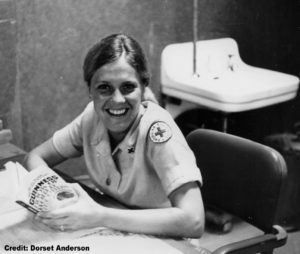 I was a nurse in later life. One time, I was getting report at the hospital, when jack hammering started. I was not expecting it and dove under the table. Of course once under there, I started laughing. The other nurse, looked under the table like I was nuts. Guess, it is called PTSD today. In 2016, I made a trip back to Vietnam. It was such a beautiful country, I wanted to see it when there was not war. It was very emotional at times. We saw many Amerasian people. Evidently, they are not treated very well. China Beach in DaNang is now a resort area and very beautiful. There are a few hangars left but otherwise I would not have recognized the place. 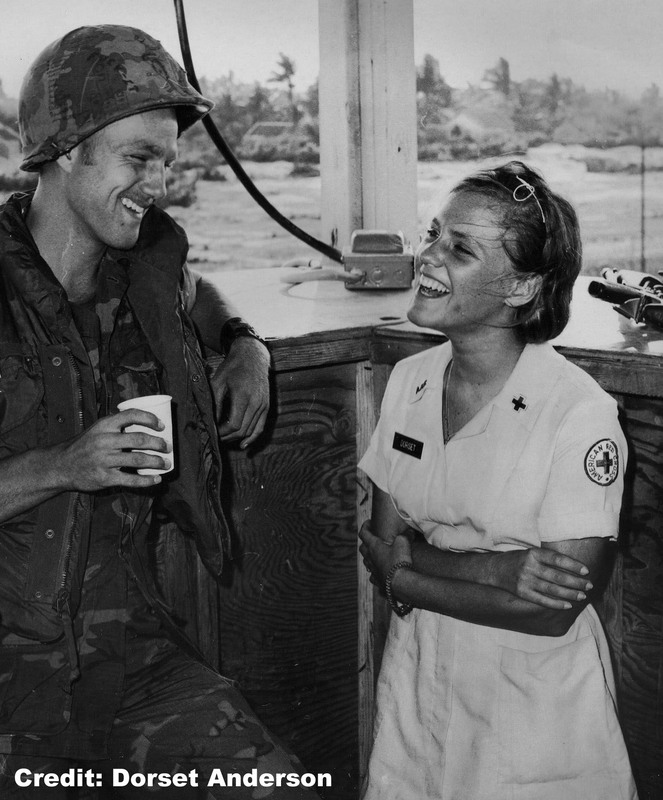 I was surprised that the people of North Vietnam were so friendly. I did not feel any resentment from the war. In fact, the young people would stop us so they could practice their English. Hanoi is modern but my impression is that it is not as well off as Saigon. Went to the War Remnants Museum and Hanoi Hilton museum. Saw many of the tanks, choppers, etc. that the US used. Interesting to read and hear their perspective on the war. Also went into the Cu Chi tunnels. So small, could not stand up and my shoulders touched each wall. They had hospitals, offices, and other rooms in the tunnels. Reminded me of an ant colony in structure. Also went to Hue, Nha Trang and Dalat. Went to a Montagnard village. They helped the US during the war. Had meetings with men who helped us during the war and they told us of their years of forced re-education after the war. Also had lunch with 3 North Vietnamese soldiers and they told us of their life. One looked especially evil. The lunch took place at the home of a family that helped the US during the war. The people seem to have gotten past their differences and do not seem to hold any animosity toward each other or us. Our guide explained that the government is communist but they kind of look the other way, especially in the south, when it comes to capitalism in the marketplace. Cam Ranh Bay is now a Russian base and the nearby town of Nha Trang is like a vacation area with lots of Russians. In many ways, Vietnam has modernized but in the countryside, I would say, it looks a lot like it did in 1968. The main difference is that they now have electricity in many places and cell phones. There is still the manual working in the field and the huts look the same with some modern houses going up. We were there, as we wanted to do something for our country. I am glad you are doing your documentary as people do not know about us. 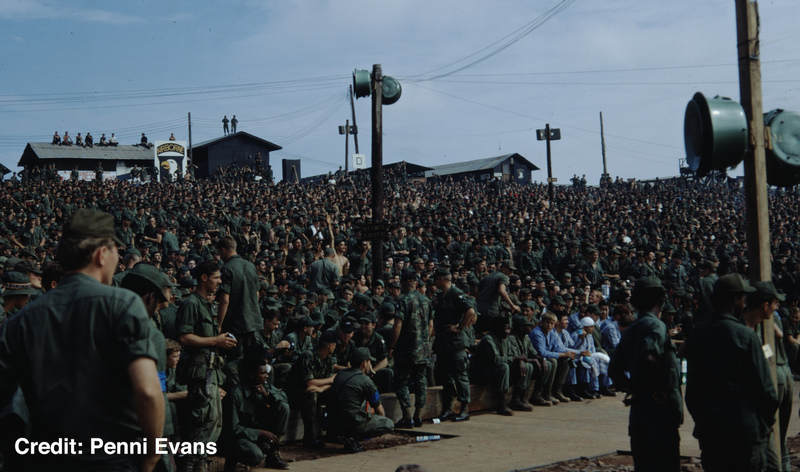 On Veterans Day, I want to stand up and say, I was there, too, but I don’t. It was an experience that molded my life. It put everything in perspective. My motto when things are not going well – nobody died, nobody got hurt. I think of all those who did not get to come home or their lives were changed forever by injuries or mental trauma. 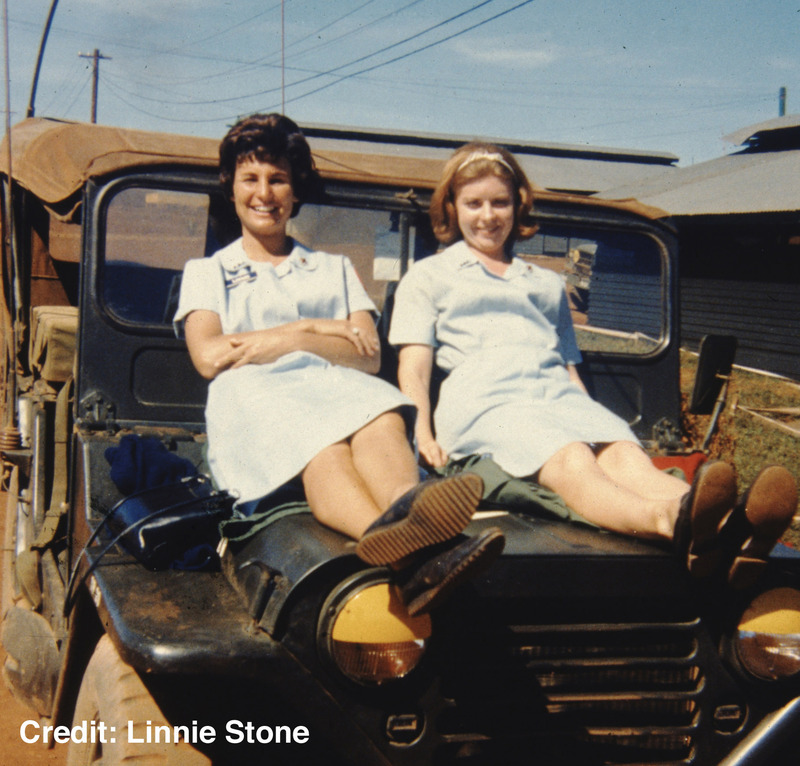 When I was a nurse, I would have lots of vet patients. They often would confide in me, as I could understand their struggles. The appreciation shown by the guys that we were there. Several times, I would run into people I knew from the states. Small world. Vietnam was a beautiful country. As a matter of fact, I returned in Feb. 2016 to go back for the first time since 1968. 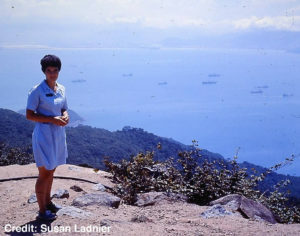 A fond memory is when I was a disc jockey for the military radio station on Monkey Mountain in DaNang. 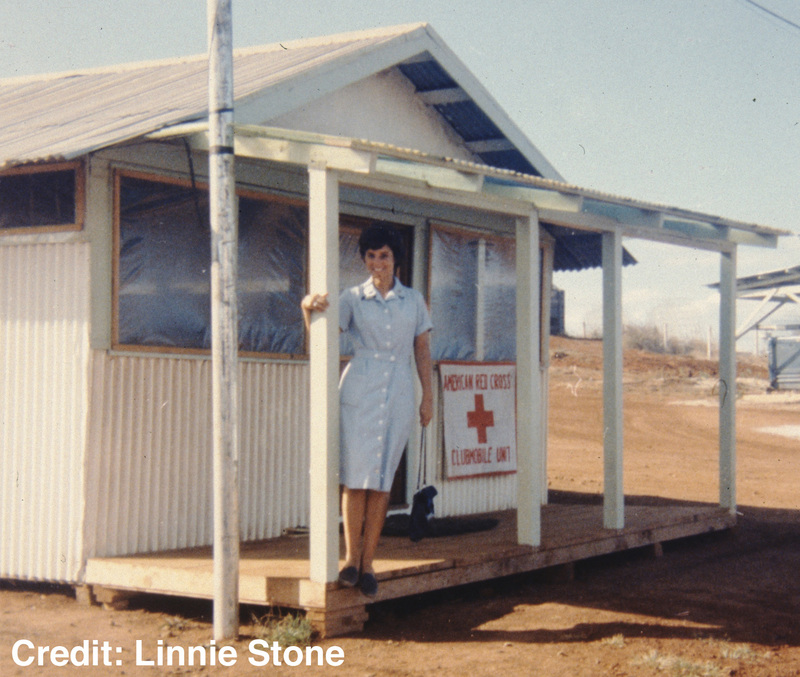 Once a week, a Red Cross girl would do the show, talk and play music for an hour. 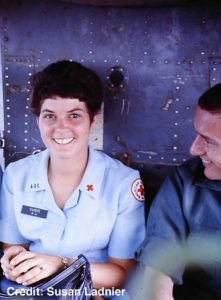 FYI, I married a Navy pilot who I met while working for the Red Cross in hospital recreation at Newport Naval hospital. 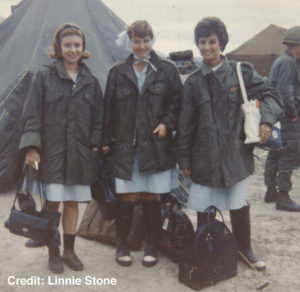 In our fourth edition of the Donut Dollie Detail, Linnie Stone tells how during a mortar attack a brave soldier led her and a Donut Dollie sister to the safety of a bunker, plus how she devised a way to help soldiers clean up their language before returning home to the “real world”. 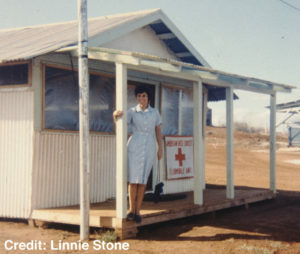 Living in Hawaii after college, I did volunteer work at the Red Cross chapter. 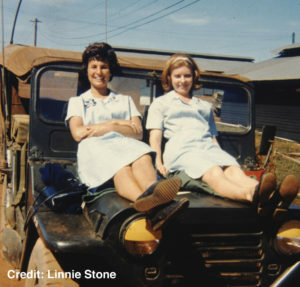 My job was to drive their station wagon to Honolulu hospitals, delivering blood supplies. One day at the chapter, the manager helped me load the wagon, and asked about my job. When I told him I worked in recreation with local kids, he said, “we’re looking for college graduates to do recreation in Vietnam”. My first thought was, “Are you kidding?” But as he talked about the job, I became interested. So I applied and was excepted. I first reconnected with my family in California. Then I went to Washington, DC for training and to Saigon for more training. Since I will discuss our many routines later, I will focus here on a specialized problem. I felt part of my job was to help our men clean up their language before returning home to the “real world”. When they thought the Donuts Dollies were out of ear shot, they swore freely. One time at our Long Binh recreation center there were three men at a card table. One was facing me as I worked on props for a game. He kept using the “F” word, not realizing I could hear him. I wracked my brain to figure out how to stop him without his buddies knowing. Finally when he glanced at me for a moment, I put my finger up to my lips for “shhh”. Shocked, he understood what I meant, and quickly looked at his two buddies. Of course, they hadn’t seen me. He immediately stopped using the “F” word and life went on. At our Lai Khe rec center, the ping-pong table was out on the veranda. It was on the other side of the wall to our office. As our men played heated games, the “F” word was yelled alot. Again I couldn’t figure out how to clue them in. Finally I found a picture of Charlie Brown and Snoopy and wrote on it, “Watch your language, Charlie Brown”, and posted it on that wall. It worked like magic, with no one embarrassed. 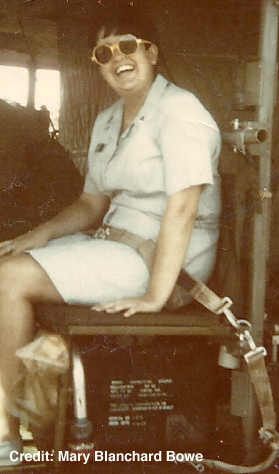 I was in 4 mortar-rocket attacks in Vietnam. 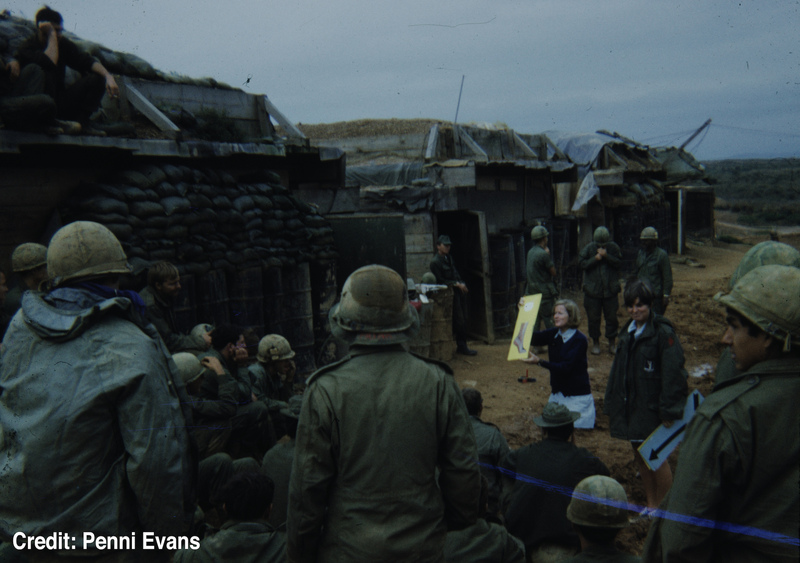 At Lai Khe in 1967, it seemed we heard outgoing mortars every night. It was called “H and I firing” (harassment and interdiction). One night at our rec center with two of us donut dollies on duty, I was running the poker party. Soon the usual H and I firing started up. Suddenly someone yelled, “Incoming!” I yelled back, “It can’t be incoming – I’m finally winning!” But it was, and the men tore off for their bunkers with all the lights out. The two of us Donut Dollies were stuck. Our rec center bunker was only half built… without a roof. So we headed for our strange, tall-sided French-style bathtub, where we kept our bulky supplies. We tossed out the supplies, climbed in and scrunched down. Shortly a voice yelled, “Donut Dollies! Where are you?” “In the tub!” we yelled back. He followed our voices and then, after helping us out of the tub, he said, “Follow me to our bunker”. We hung onto each other as we crossed a wide open area in the pitch black night. As we entered the bunker, the men couldn’t see us, and were telling racy stories. Our “protector” said, “Hey guys, clean it up. The Donut Dollies are here”. They not only cleaned it up, but also made hysterically funny comments for the next few hours. We were laughing so hard, it sounded more like a party than a mortar attack. But it helped us all get through a scary night when the mortars were exploding way too close. 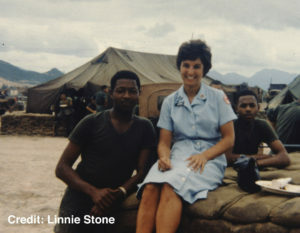 We visited our men in the hospitals on a regular basis. 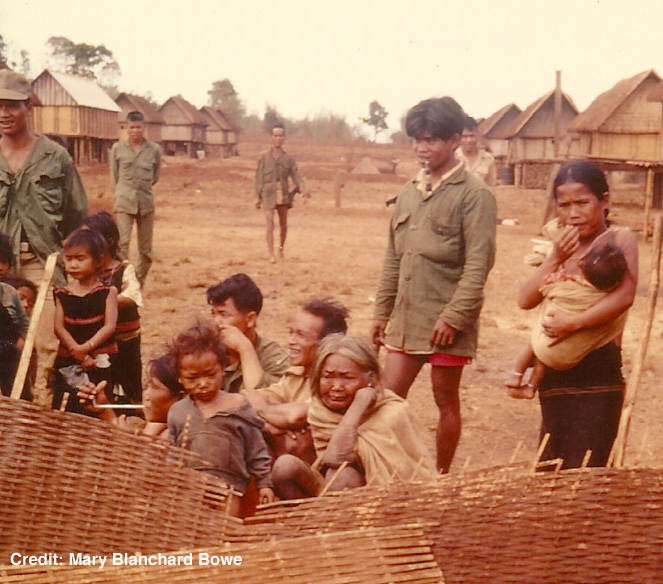 In Pleiku, there was a serious attack on the nearby 25th Infantry, where the only men who were left back at the base camp were short-timers (soon to go home). I could only say, “You take care”. He said “Thanx for coming to check up on us”. I nodded and turned quickly so he couldn’t see my tears ready to fall. As I pulled myself together, I headed to the next wounded soldier. 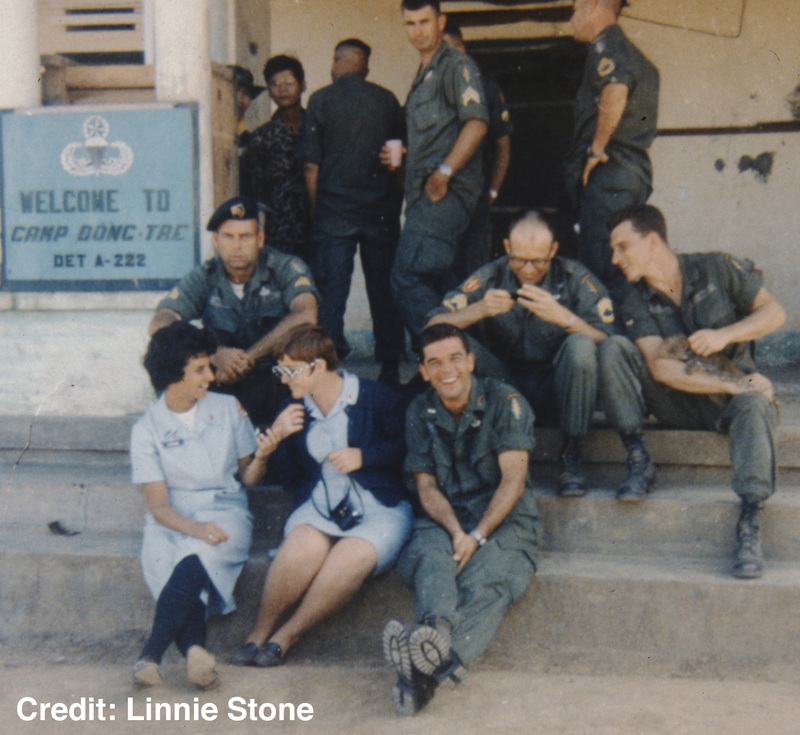 Returning home in the end of 1967, I enjoyed the peace and quiet of being away from a war zone. Being home with a loving, supportive family was so comforting. But our country was still being torn apart by the war. 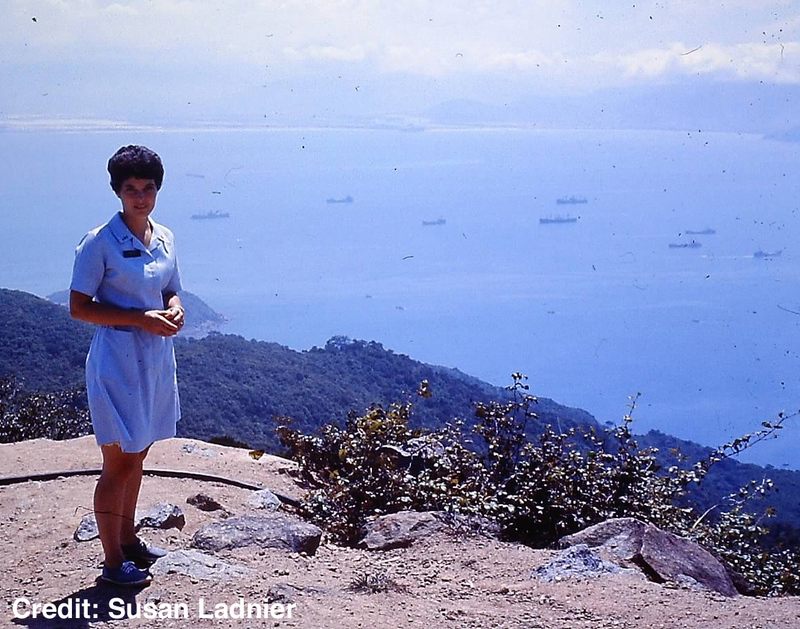 In August 1968, I moved to Australia, where I lived in Sydney and taught ballroom dance for year. I then traveled the country, working as I went. It was what I needed… to be free of the Vietnam War, which had become a battleground at home in America as well as in Vietnam. 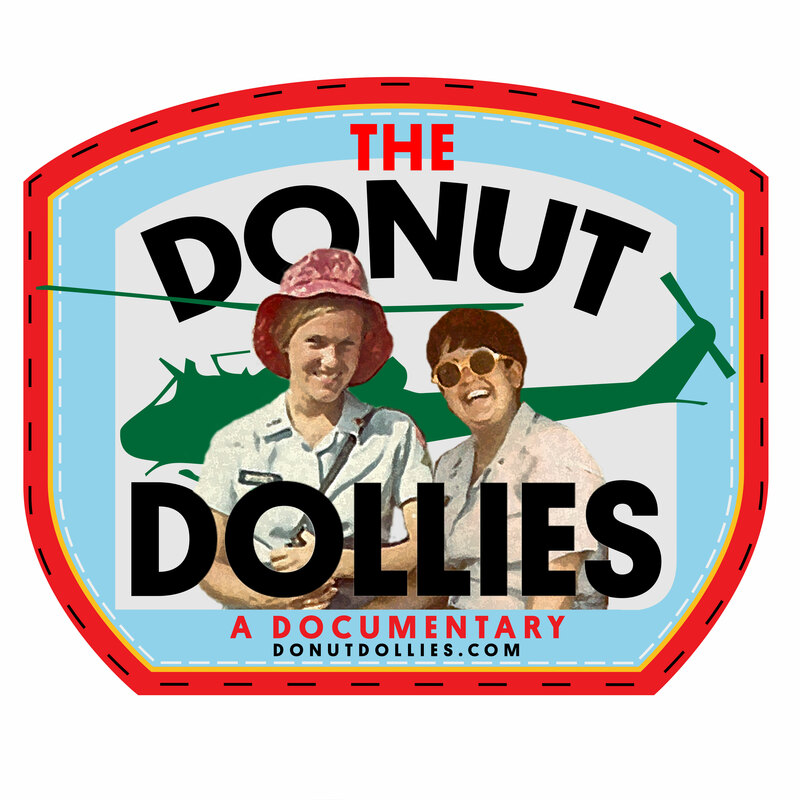 Donut Dollies had a choice to go to Vietnam, whereas the servicemen didn’t. Once I got there, I felt we could bring humanity and a touch of home to our men through recreation, conversation, and smiles. And in the hospitals, nurses were saving lives. I admire them for being able to experience the daily challenges and tragedies they faced, and still focus on what had to be done. I’ve been volunteering at a VA recreation program for nearly 4 years. Many of the vets have stories from World War II, and others from Vietnam. 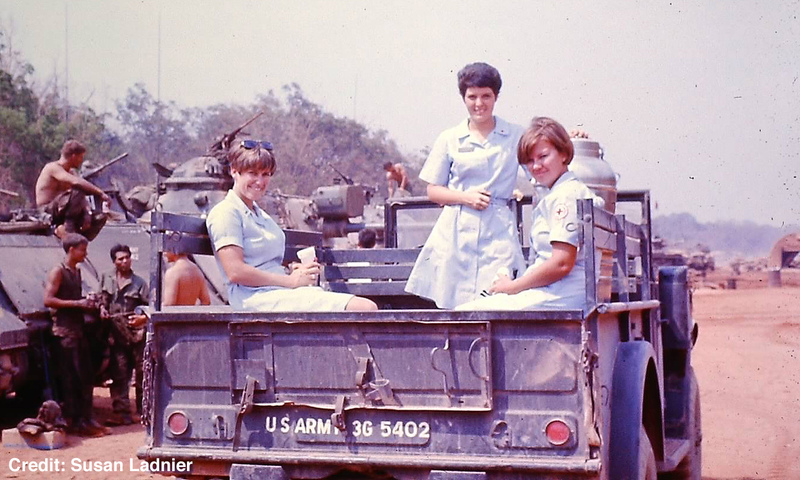 They seem appreciative that Donut Dollies were actually willing to volunteer to go to a war. 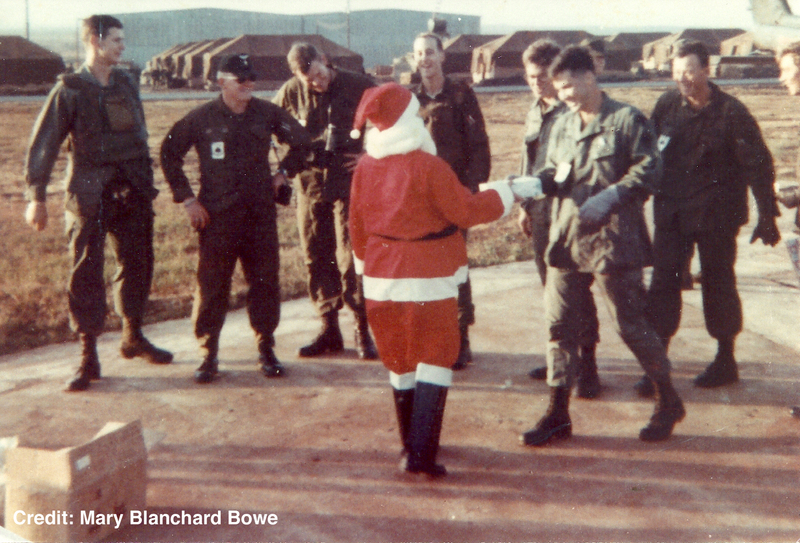 Some of my fondest memories are from working with our men at our Lai Khe rec center. There were four of us Donut Dollies working out in the field and at our rec center there. The center was open every day from 9 AM till 10 PM. Since I had had rec center experience in Hawaii, they decided my second day there to let me be a rec center chairman – yay! 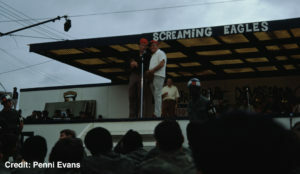 In the evenings we had various programs, but Friday became the night for our special programs with all four of us there. 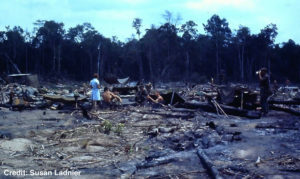 With new man who had been out in the field a long time, our program usually started off slowly. 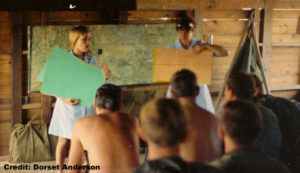 One of my first nights there, I was leading charades with four tentative men. As the game picked-up and others heard us yelling, they joined in. Two hours later with 25 enthusiastic man, we had to wrap up, since the center was closing. The final score was 94 – 82! * we had a roundtable discussion with a heated debate over the popularity of softball vs. dragracing (their choices). The men were all trying to out yell each other, while I was neutral but arguing points on both sides. * we had a “psychedelic night”, where we brought out the washable paints to decorate everybody’s faces, arms, and legs. Of course we Donut Dollies were the first guinea pigs to be painted. Then the men got into the spirit of it, and painted each other, with lots of laughter, of course. * with everyone decorated, we then had simultaneous jam sessions: folk music in the music room, and soul music out on the veranda with one man on piano, and three others harmonizing.